We just heard the best news! Baby girl Roeske is going to be born TODAY - on Christmas Eve!! Welcome, Eliza! Mommy Roeske was given a baby shower a few weeks ago, and her super thoughtful sister-in-law wanted to create a thumbprint guestbook for the event. I've made thumbprint guestbooks for weddings before, and they were shaped like leaves on trees, but this new shape is really fun! 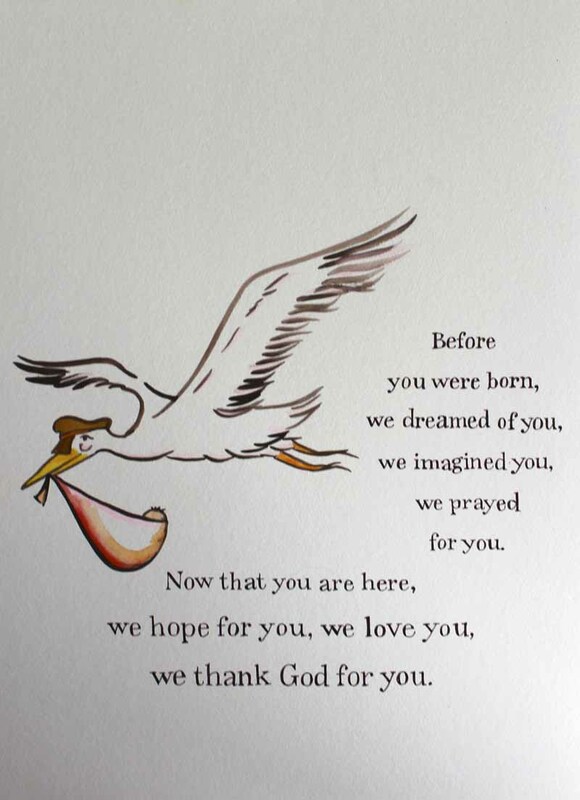 The guests' thumbprints are balloons carried by the stork. The hostess provided the quote, which I wrote in brown ink, then I painted a brown-and-coral stork in watercolor. This is going to be one sweet, beautiful, and much-loved baby! Her parents and family are amazing people. I hope she sees this in her nursery someday and knows how much we all wanted her to arrive.